Firemen desperately try to put out fire, but hoses don’t reach the top floors. Photo from Cornell archives. 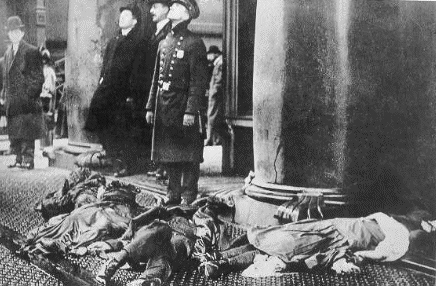 The Today in NYC series often covers obscure corners of New York City political history, but one of the most important and most tragic events in city history took place on March 25, 1911: the Triangle Shirtwaist Fire. 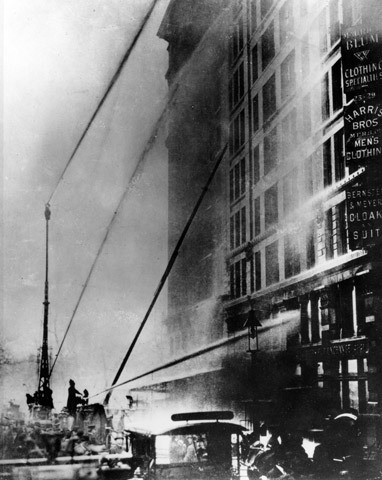 On that afternoon, a fire broke out on the top floors of the Triangle Shirtwaist (women’s blouses) factory in the old garment district, killing 146 workers, mostly young women. The bodies of 40 workers lay strewn on the ground as firemen surveyed the fire. From U. of Missouri archives. Albany, which had earned its reputation for inaction even a century ago, moved with uncharacteristic urgency, with reformers and Tammany Democrats working together. The Commission investigating the fire was led by State Senator Robert Wagner, who two decades later as U.S. Senator created the National Labor Relations Board and helped sculpt the New Deal. (His son served three terms as NYC mayor.) The Commission Vice-Chair, Assembly Minority Leader Al Smith, later pioneered the proto-New Deal as governor of New York. Commissioner Samuel Gompers, founder of the American Federation of Labor, rallied union support for the commission’s work. Chief Investigator Frances Perkins went on to head the New York State Department of Labor before holding the position nationally under FDR, America’s first female cabinet member. The Commission held dozens of hearings and interviewed hundreds of witnesses across New York State from 1911 to 1915. Their legislative recommendations produced sweeping changes to New York’s workers compensation, worker safety standards, child employment regulations, building codes (requiring sprinkler systems and “panic bars” that one punches to get out certain exits), more than 20 laws in total. Unfortunately, following the impeachment of the reform-minded Governor Sulzer ni 1913, the business community fought back, arguing that these regulations would drive business out of New York.